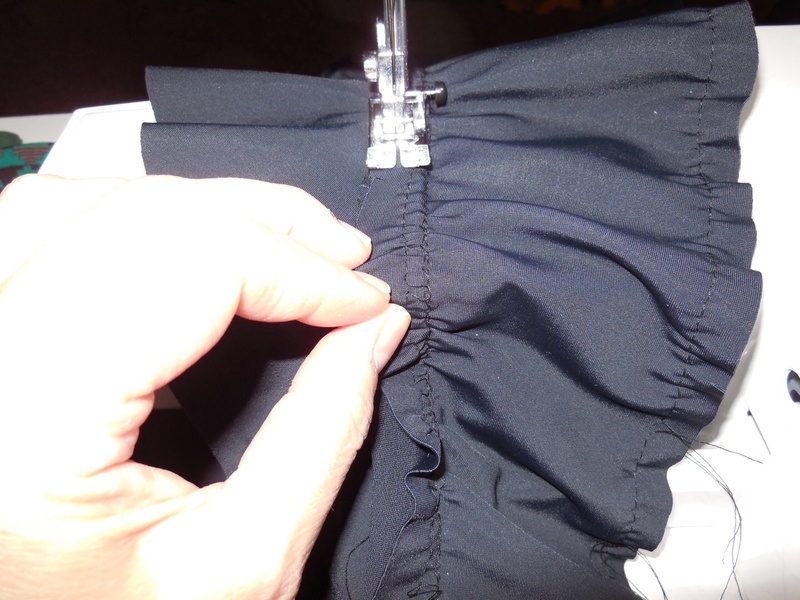 Sew the right sides together! – Nice dress! Thanks, I made it!! I had some of my Matching Stripes! 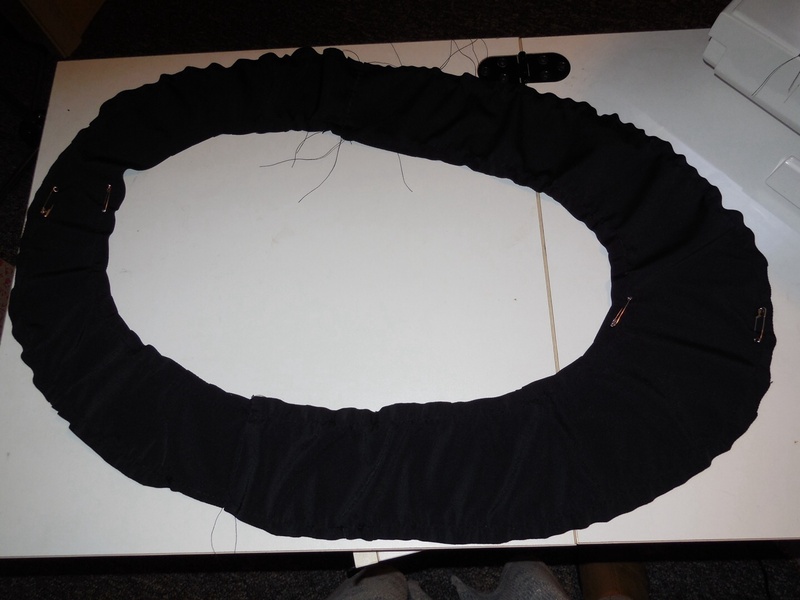 polyester spandex left over, just enough to cover my front and back, and some black poly spandex left over from another project for the double sided yoke, so I was ready to roll! 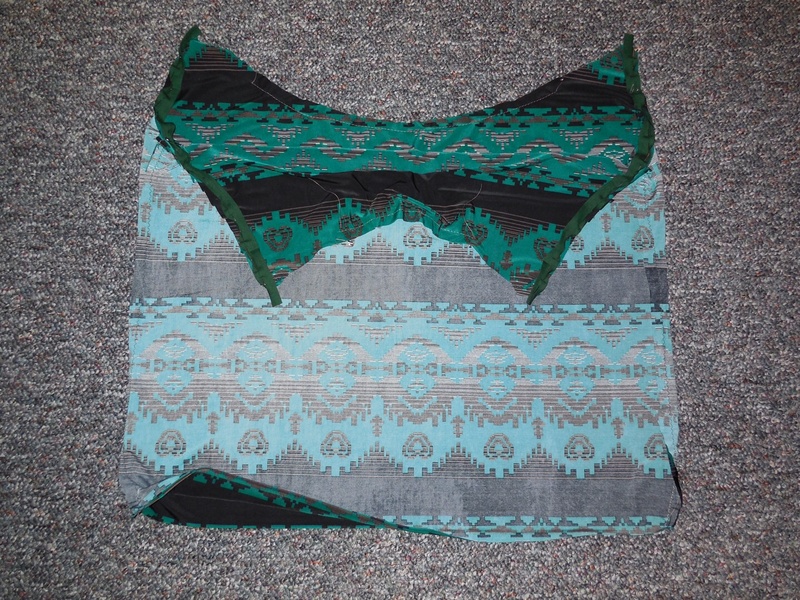 I put my front and back together, matching the stripes in the side seams. 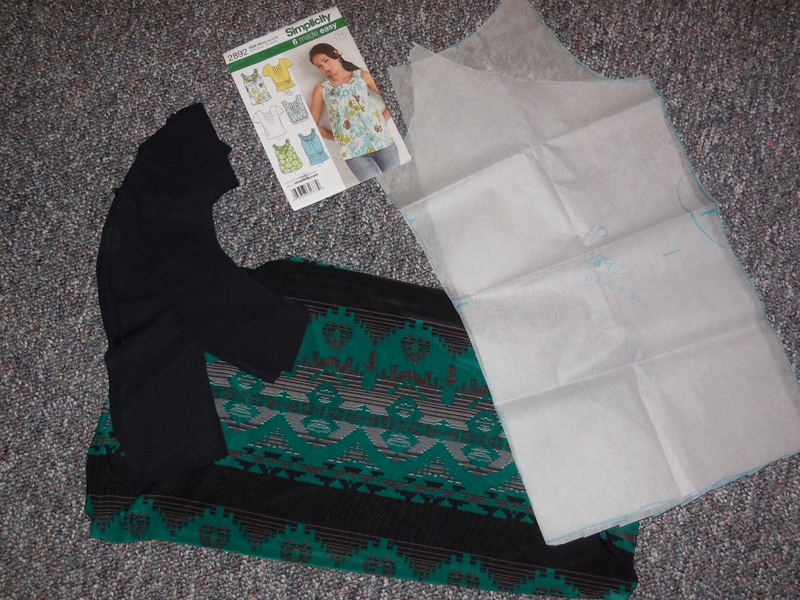 I gathered the top neckline, front and back, and sewed single fold bias tape on both armholes. Now for the yoke neckline. 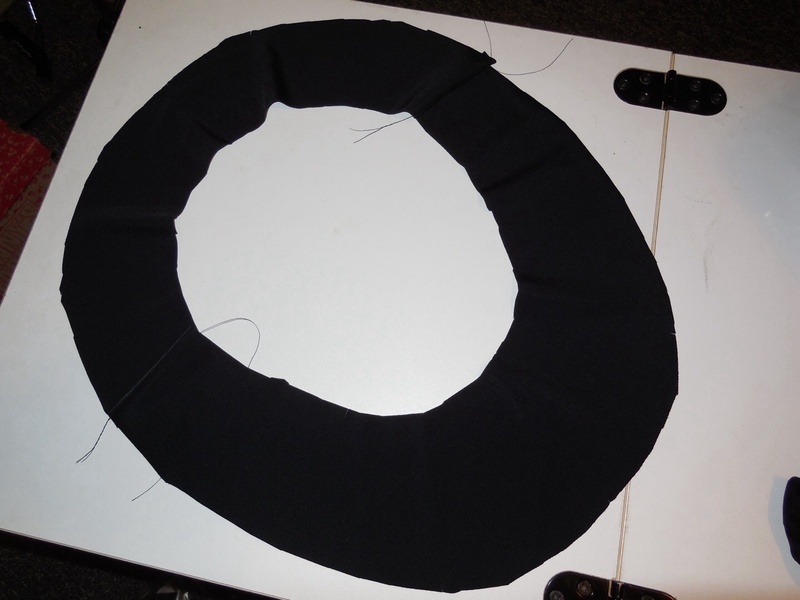 I sewed the front halves and the back halves together at the shoulders seams. This one is smaller. It is not gathered. This one is bigger. It is gathered at both edges (around the circles). 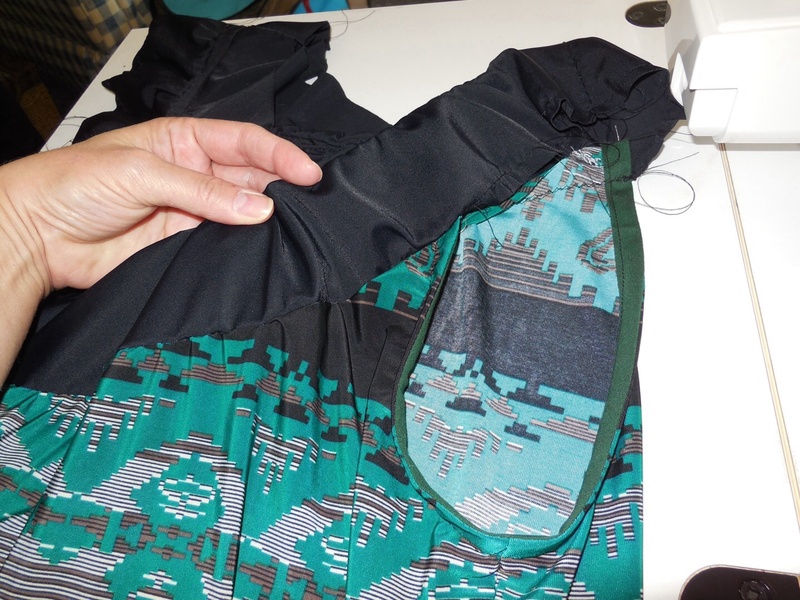 Since it is a stretchy knit, I expect the neckline might stretch out over time, so I sewed the seam down too, to the un-gathered side of the yoke. I pinned the finished yoke to the rest of the top and tested it out on Dolly. 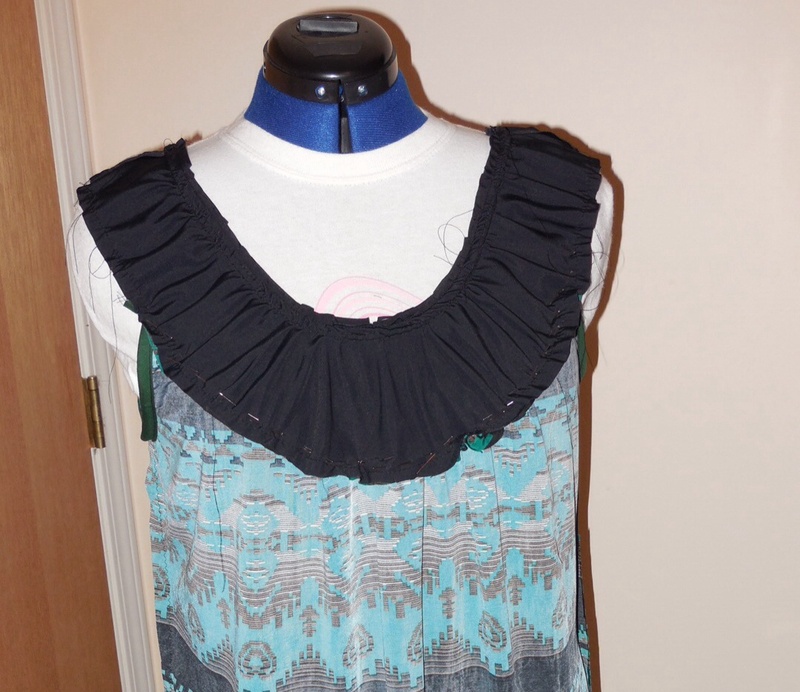 So… Maybe you can’t see my mistake in this dark photo, but I am lucky I pinned the yoke on (not sewed it on) and walked away, because when I returned I noticed that the gathered yoke was looking good, I could see all the ruffles in the fabric, but the body of the top was inside out! Duh! 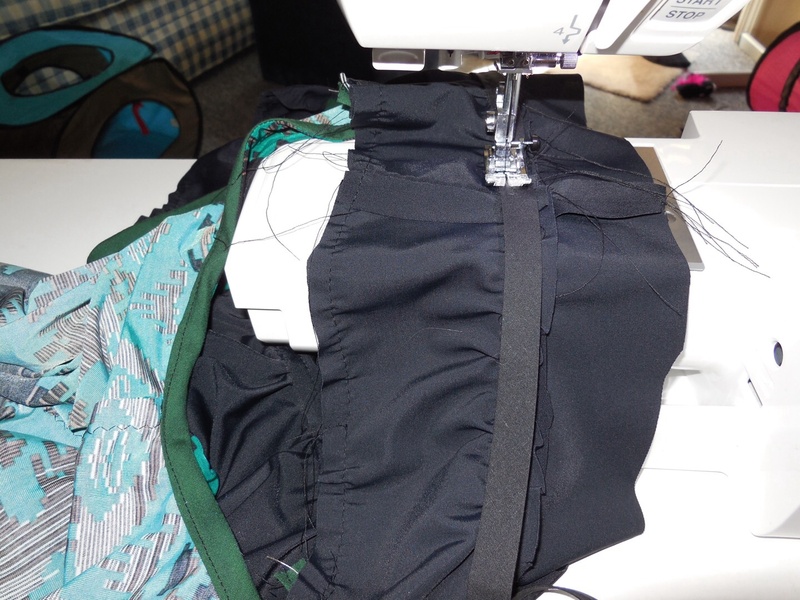 Pull the pins, put the right sides together, pin it up again and sew it up! 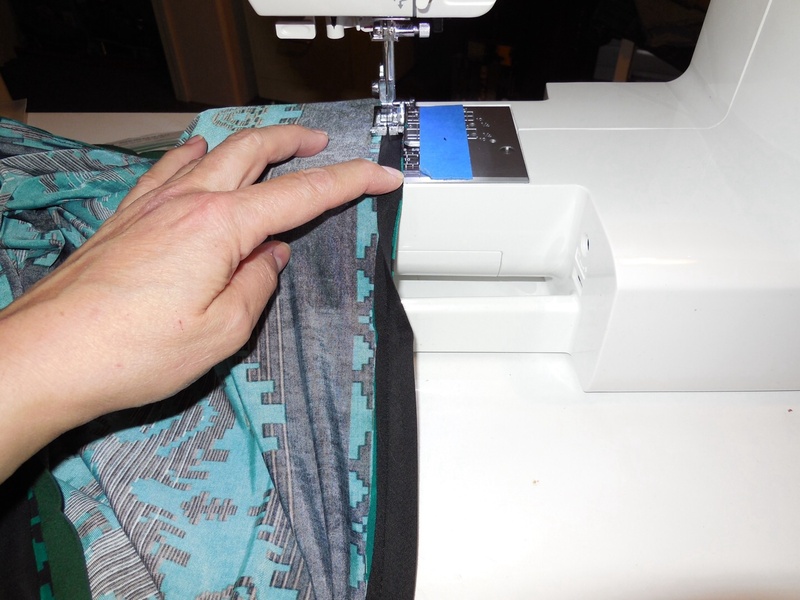 I also decided to sew seam tape on the yoke seam to prevent future stretching, before I hand sewed the underside of the yoke down. 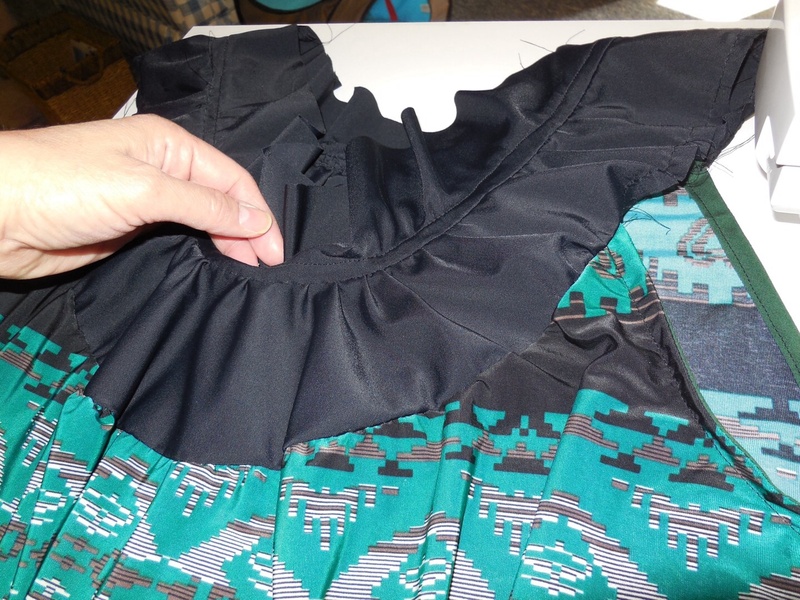 Hemmed up the bottom with single fold bias tape. Done! Almost perfect matching of the stripes. Dolly’s got a new top! It looks great! Please break more rules 😉 It works! 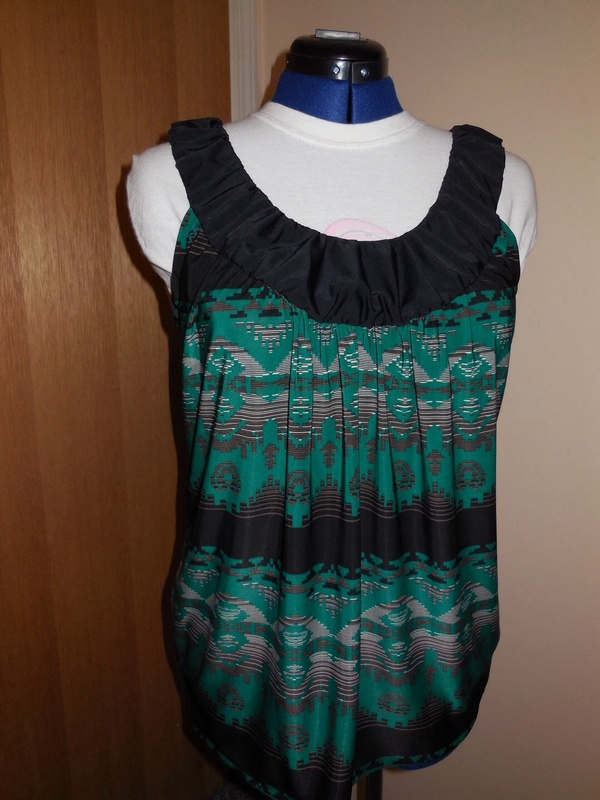 Super cute top! I love the color. Thank you! It was a pretty easy make too! I LOVE this blouse. The colors, the varying colors of blue with the black collar. Beautiful! I’m sure you’ve already told us but what pattern is it again. With the warmer weather I’ve realized I have no spring clothes!! 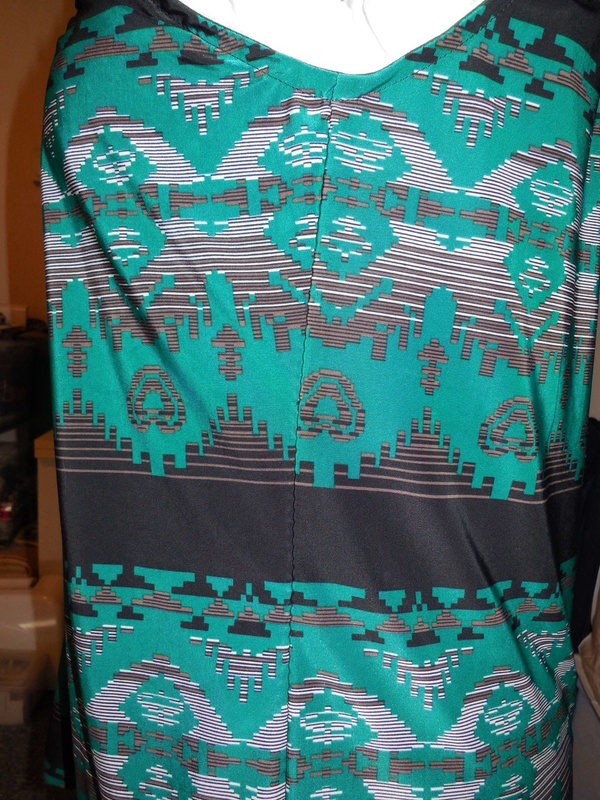 Love the colour and the pattern. Good job. 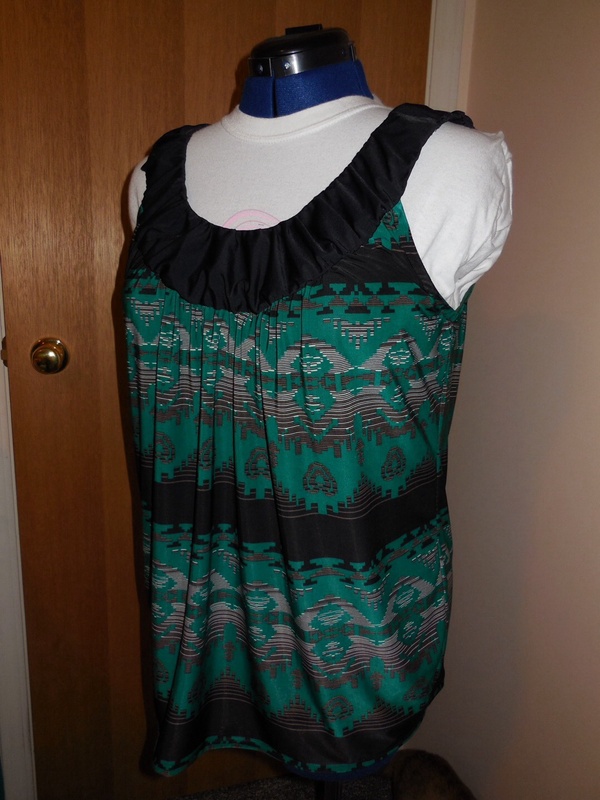 You could wear this blouse with white pants and black pants. Versatile. Thank you! It’s Simplicity 2892, there are actually 6 different tops in the package. One of my favourites! Reblogged this on The Monthly Stitch. Wow that’s such a stunning top, loving the neckline and colour combination. Great idea to adapt a woven pattern, I’ll have to give that a try! Thank you! I might have been lucky in putting it together. But it sure is nice for the warm weather!